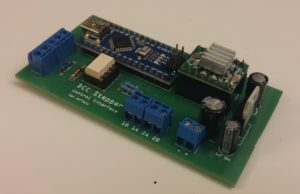 Here’s an example of how you can use the new DCC Accessory Decoder PCB from Dcc Interface (in the UK) that combines an Arduino Nano, a A4988 Stepper Motor Driver module, an optical sensor and a DCC signal interface, to quickly let you drive Stepper Motors based on DCC Turnout Commands. I’ve written an example sketch that uses this DCC Accessory Decoder PCB to control the position of a stepper motor from a DCC Accessory Turnout Commands and here is a quick video of it in action. Here’s the Arduino sketch I used in the video above – enjoy! // The A4988 Driver Board has 3 pins that set the Stepping Mode which are connected to 3 jumpers on the board.